This is a small diameter, light duty fire/water hose specifically used to fill pump cans, supply sprinklers, and for remote fireline protection or mop up. This hose is not to be confused with layflat style garden hose as it is not designed to be dragged across gravel, asphalt, or any abrasive surface (especially at low pressures, which will also result in kinking). It is lightweight and easily stored (a 50' coil is 9" in diameter). Lengths are coupled with light duty brass GHT ends (GHT nozzles and pouches are sold separately). NL9709 has a yellow specially treated, durable cover for resistance to wear and absorption. 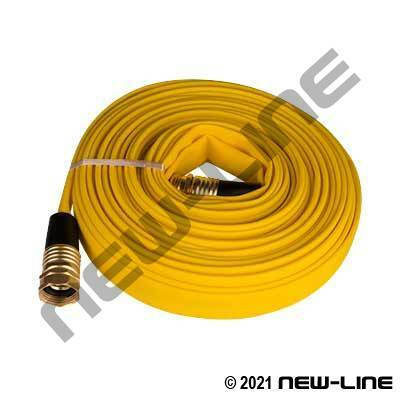 We also offer an entry price point, non-treated white hose (A9708) as a competitive option to lower end, one time use type hoses that are on the market; it should be noted that this hose is not designed for washdown, dragging, or longer term use - it does not have a protected reinforcement and will fail once the cover is frayed. The HW4100 is a simple device to quickly re-wind this hose from the fire scene, stripping out mud and water for a neat, compact roll. Note: Due to the thin wall of this hose it is not designed to be repaired. Typical Fittings: Each length coupled with economy spun brass GHT threaded ends. Note: This hose is not designed to be repaired. Construction: Tube: Urethane elastomer. Jacket: Circular woven, 100% virgin polyester (NL9708 white is plain while the NL9709 yellow has a special exterior treatment for added resistance to abrasion and absorption). Temperature Range: Remains flexible to -40°C (-40°F). Detail Comments: This hose is not designed to be repaired. Notice: Fire prevention hose, ensure coupled/maintained safely.